Description This Thomson, Georgia hotel has free internet access and non-smoking guest rooms. This hotel is also pet friendly. Free breakfast free internet and a prime location near the interstate and dining are top amenities of the Econo Lodge Thomson. The two-story hotel's 47 exterior-corridor rooms have free high-speed internet in-room safes and cable TV with HBO and ESPN; some rooms have microwaves refrigerators and coffeemakers. The hotel's free hot breakfast allows guests to fuel up for a busy day. Guests can enjoy a free cup of coffee from the lobby while they use the fax and copy services at the business center. Pets are allowed for a fee. The hotel is off I-20 less than three miles from Thomson. Guests can walk to restaurants in less than five minutes. Find out about local history at the Hickory Hill Museum in a restored Georgia home about three miles away. Go hiking fishing or swimming at Mistletoe State Park about 15 miles away on Strom Thurmond Lake. Hit the links at Belle Meade Country Club two miles from the hotel. Augusta and the Augusta National Golf Club are about 29 miles away. Hartsfield-Jackson Atlanta International Airport is 124 miles away. 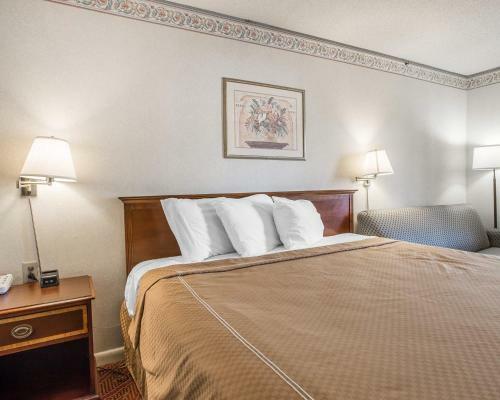 Add Econo Lodge Thomson to your free online travel itinerary.